THE THIRD INTERNATIONAL SUMMORUM PONTIFICUM PILGRIMAGE TO WELCOME THE TENTH ANNIVERSARY OF JUVENTUTEM IN ROME! 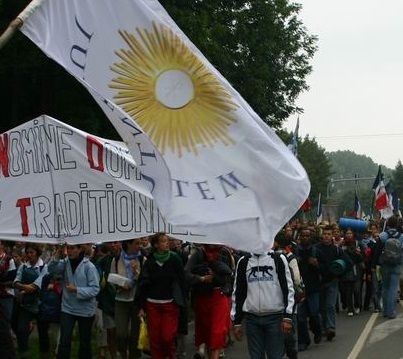 Juventutem during the 2005 WYD. On the occasion of the ‘Populus Summorum Pontificum’ pilgrimage taking place in Rome from October 23-26, 2014, the Foederatio Internationalis Juventutem (the international organization of youth brought together by the Traditional Latin Mass) will celebrate its tenth birthday. All Juventutem members and friends are warmly welcomed to take a special part in this event. On Friday, October 24th, beginning at 11:00AM, under the guidance of Fr. de Malleray, FSSP, chaplain of Juventutem, special events for Juventutem delegates will be held at the Church of Trinità dei Pellegrini, the personal parish in Rome. As Juventutem has given its support to the Summorum Pontificum Pilgrimage since its founding in 2012, it is fitting on their tenth anniversary that they have a momentous place in this year’s program. Indeed, it was back in 2005, for the Cologne WYD, that for the first time in history young people attached to the Usus Antiquior gathered under the banner of Juventutem. It was also the first time, as a herald of Summorum Pontificum, that the Church welcomed a group of Latin Mass goers in one of its official celebrations. Hence, the Friday Solemn Mass of the Pilgrimage will be said with and for Juventutem members. All the pilgrims will join for what will surely be a thrilling moment of this year’s pilgrimage as it will show how the extraordinary form of the Mass has profoundly attracted the youth and inspires them to place their faith at the heart of their lives. The Juventutem Anniversary Mass is scheduled at 6.30pm on Friday, October 24th at the Trinità dei Pellegrini. This entry was posted in #sumpont2014. Bookmark the permalink.